I've just spent a week or so in England visiting my daughters. Justine, the eldest is a gifted gardener who grows some beautiful dahlias amongst other things. 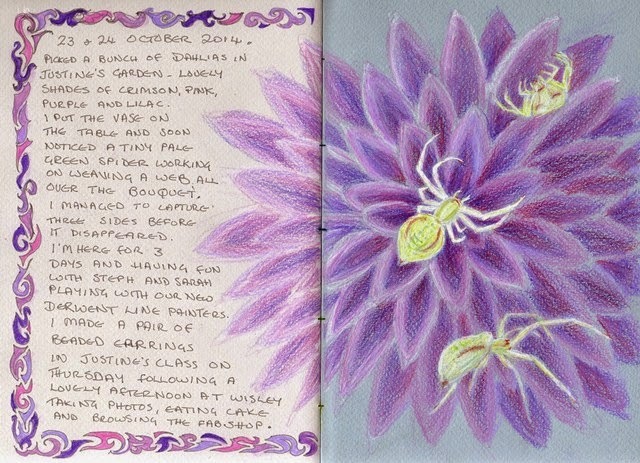 I gathered a lovely bouquet to draw and imagine my surprise when this tiny spider appeared and started to weave a web. I managed to sketch 3 different sides of it as it worked and the drew the flower afterwards. The body, only the size of my little finger nail, looked a bit like a skull from one angle and was a translucent, creamy green colour, does anyone know what it is? Thank you, I've had a look at the website and that is exactly what my spider looked like. From the description it seems it was a female, which is how I described her to myself while I was drawing.